With the hot weather and long nights now here it is officially BBQ season. However, before firing up the barbie, it is important to make sure that you are not putting your or anybody else’s health and safety at risk. 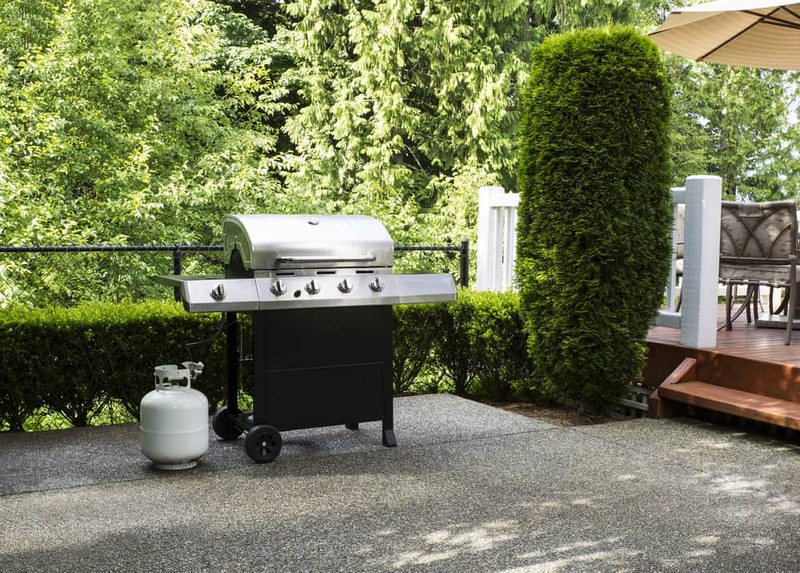 Emergency services respond to an average of one barbecue related incident per day during summer which is primarily caused by damaged gas cylinders, unattended barbecues, and improper cleaning and maintenance. These incidents can be easily avoided with a few simple checks. There are a few common areas that should be checked regularly to ensure that the barbecue is safe for use. The gas cylinder must not be used or refilled if it appears damaged, especially around the valve or it has not been tested for over 10 years. The date the cylinder was last tested should be stamped on either the collar, neck or foot ring of the cylinder. If you are unable to get your gas cylinder tested, exchange it at a reputable supplier. Only use hoses and connections designed for gas NEVER use home-made ones. Regularly check the hose to make sure it has not perished, cracked, crushed, stretched or kinked. To prevent kinks in the hose make sure you keep it gently curved. When not in use, the hose should also be protected from heat and sun exposure to prevent any damage. Damaged hoses or regulators should be replaced immediately before use, even if the damage appears minimal. If the hose does not appear damaged, it is still good practice to replace the hose every 5 years. It is not just exterior damage that should be checked for. Hoses should also be inspected for blockages, such as spiders, especially if they have not been used for a while during the winter months. 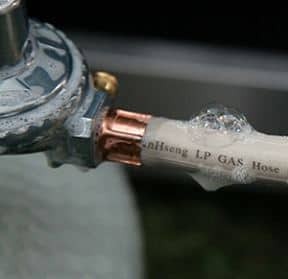 Hose and regulator connections should be checked regularly before every use to make sure they are tight and are not leaking. Gas has a distinct smell to help raise awareness of leaks; however a good way of finding leaks is to perform the Soapy Water Test. It is advisable to test the entire assembly, from the gas bottle valve all the way to where the gas hose attaches to the barbecue. 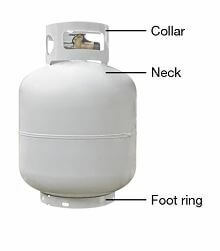 At the very least, the test should be performed every time the gas bottle is connected. To perform the Soapy Water Test, you will need a soapy water solution. Mixing liquid hand soap or common household detergent with water works fine. This should be added into a spray bottle. It is important not to use any products containing ammonia as barbecue valves and fittings are made from brass. Ammonia can cause brass to become brittle and crack, which damages the integrity of the unit. Turn on the gas bottle without turning on the barbecue to pressurise the system. Coat the connections with soapy water using the spray bottle. Bubbles will appear if there is a gas leak at that point. Turn off the gas to tighten the connection if necessary and perform the test again. If bubbles still appear, immediately shut off the gas and have the fault repaired by a licensed fitter, or replace the faulty component. These simple checks will ensure that the sausages are the only things at risk of getting burnt at the next barbecue and that you, your family and friends remain safe.